9:00 A.M. to 4：45 P.M.
※Pleace contact Sendai Science Museum for more details. ※ Please change from "_at_"to"@"
An exhibition room where visitors can experience the natural world. This exhibition displays living creatures that inhibit Sendai. which extends from the Pacific Ocean to the Ou mountains. The exhibition is categorized into five groups;islands,tidelands,plains,rivers,and mountains and displayed. 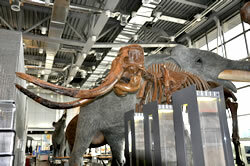 Fossils found in Miyagi prefecture and representative prehistoric elephants representative of that age are displayed in the Earth Science section. You can also see the minerals mined in the Tohoku region and experience the earthquake simulator"Gurari-kun". Numerous specimens can be found inside the jungle gym-shaped forest at the center of the exhibition room. An exhibition room where you can experience the wonders of the science. The "ship," which is shaped like a spaceship, is full of exhibits you can experience with all of your five senses. Four themed exhibits are located between the element columns that line the exhibition hall. 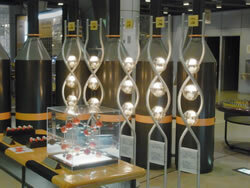 Scientific technology inventions and discoveries made in Sendai are shown here. All equipment is interactive. 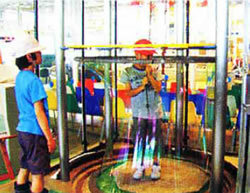 An exhibition room where you can experience the science of everyday life. There are exhibits about life science, science of play, environmental science, and flight. We recommend the "Challenge Lab" where you can choose which experiment to try yourself. Walk through the rocks, touch them, feel them, and observe their characteristics and differences. 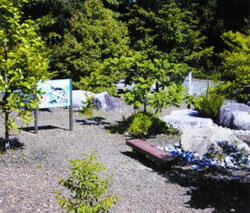 Walk through the Nature Observation Path and look at plants. The deck will give you a panoramic view of Dainohara Forest Park. Copyright (c) 1996 - 2011 Sendai Science Museum.All Rights Reserved.